In the run up to the 2012 local elections Cambridge Liberal Democrats decided to stand up to those who usually exert greatest influence in Cambridge, the largely elderly home owners who populate the residents associations, and made an election commitment to improve lighting on Cambridge’s green spaces. Specifically the Liberal Democrats running the city council responded to concerns raised by student Liberal Democrats, and a Cambridge University Students’ Union campaign for the Right to Light and promised to act. According to councillors speaking at the last West/Central Area Committee first area to to see new lights will be Parker’s Piece, with councillors’ favoured option being solar studs as found on a number of cycle paths just outside the city. Over the weekend at the Town and Country fair on Parker’s Piece I stood next to one of the main paths, at the Cambridge Cycling Campaign stand where they had some of the solar studs on show, and discussed the council’s proposals. My attention was drawn to the alternative form of floor level lighting illustrated above which is in use in at Cambridge Leisure. 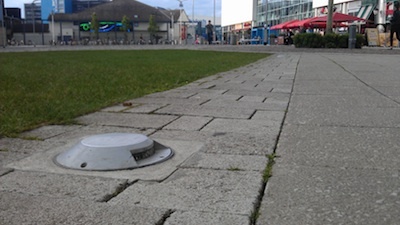 This, while not in that instance solar powered, illuminates the path and the surrounding area rather than simply providing points of light pointing up into the eyes of cyclists and pedestrians. I think it would be a good idea for councillors to consider such a style of lighting for the paths across Cambridge’s green spaces, as it would in my view probably help those crossing the space maintain their night vision and awareness of their surroundings and do more than simply mark the edges of the park and actually provide some illumination of the area. I’ve particularly been lobbying for improved lighting on Jesus Green, I used to commute over the green for a number of years, often in the dark, between the crime hotspot at Jesus Lock bridge over to Park Street. I received a hostile reception from local residents who largely make up the Jesus Green Association who oppose better lighting, but have kept campaigning, and lobbied for lighting to be included in the latest Jesus Green lottery bid, although it’s hard to keep track of what’s going on as there is a lot of secrecy surrounding the bid process. Personally I think two extra street lights would be ideal for Jesus Green, and more in-keeping than ground level stud lights of any form. I think Parker’s Piece has a more urban setting and can see the stud lights might be suited there, though again I’d go for a couple of street lights. Councillors will probably find solar studs easier to install as they won’t need an ongoing power budget to be found, and won’t I expect form part of the county council’s outsourced street-lighting contract. Unfortunately what’s practical in-terms of local government process might be as significant a factor as what the best thing to do is considered to be. Provision of additional amenity lighting at the mid points of the paths across Parkers Piece following concerns over community safety. Gives an estimated cost of £30,000 and notes £8,000 has been secured towards this. Very sensitive green space. Fine balance between the intrusiveness of lighting equipment versus the improvement to lighting levels. Proposals may not lead to the majority in support. Securing the future maintenance and ongoing revenue implications will also need to be resolved. “Ongoing revenue” indicates that mains powered lights, not solar, might be being considered. The snappily named Home Office Research Study 251 from 2002 reviews research on the impact of street lighting on crime. The picture is mixed, and potential mechanisms for street-lighting influencing crime are surprisingly convoluted and complex. Better lighting could, and reportedly has in some places, resulted in greater disorder and crime, it can encourage people to gather and can help criminals identify targets as well as make people feel safer. If people feel safer and lighting makes an area more attractive to walk through then more people might be present in the area; and the presence of other people is something which could make criminals think twice about committing an offence. Cambridge Liberal Democrats are very very slow at getting things done. They recently took seven years to get cycle parking installed off King Street. If they’re not going to get the lights in for this winter, then perhaps there might be an opportunity to so some research on the impact of the new lights, improving the recording of crime in the area where lighting is to be improved, so the effects of the new lighting can be analysed. I think lighting is a local issue, and one which councillors who are aware of what those using the areas want, are best placed to make judgements on what to do having regard to all the available evidence. Each space has unique attributes. Cambridge has some factors which are not mentioned in any research on lighting, crime and safety, for example the prevalence of cyclists without lights crossing the green spaces in the dark, creating a collision hazard for those walking and cycling. Cambridge’s West Central Area Committee is meeting on the 21st of June 2012. 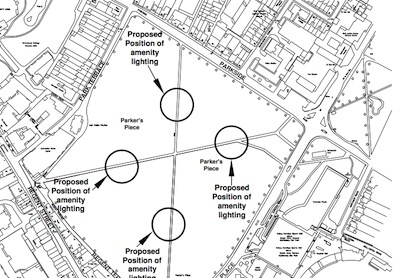 If the council will consider the ground level lights which cast their light onto the ground, rather than up into the air for lighting green spaces including Parker’s Piece, and to query why the report states lighting is being considered for the “mid-points” not the full lengths of paths. I’ll also ask what the plan is for improving the lighting on other green areas, including Jesus Green. If the committee would add “chair’s actions” and “correspondence” items to its agendas it would allow, among other things, some of the complex issues raised during the open forum to be dealt with more efficiently by email. This was an idea Cllr Kightley spoke in favour of at the beer festival. asking how many councillors have viewed the full online planning files for the applications they are determining; and how many did so while logged in so they could review comments marked “sensitive” and not available to the general public. I’m concerned that few councillors appear to have read all the relevant documents prior to turning up to consider planning applications. questioning if councillors are confident Love Cambridge is not being used as a mere conduit for funds from Magdalene College allowing it to give the impression an public environmental improvement scheme on Quayside which it, extraordinarily, is being allowed to “promote” has wide support. question what “promotor” status means in relation to an environmental improvement scheme. If it means the same as “lead councillor” does in North Cambridge then it is entirely inappropriate in my view for anyone other than a councillor, or committee of councillors to hold that role, as it involved being given delegated power to approve changes to the design of schemes. I have successfully opposed such delegation to a residents association in North Cambridge and would oppose its delegation to the Friends of Midsummer Common, or a Cambridge College in the West/Central Area. This entry was tagged Cambridge, Cycling, Lighting, Street Lighting on June 21, 2012 by Richard Taylor. The road to the Lammas land car park is also on the agenda. Officers advice a cycle path is impractical, as valuable green space would need to be taken up. The idea is dismissed. I think that the short car park access road could be made primarily a cycle way and cyclists given priority and overtaking of cyclists banned on the short stretch. As always the issue of the traffic lights at the end not responding to bikes is raised, with a note saying the County Council will be asked to act. In my view that junction needs rejigging for cyclists, who ought be provided a by-pass allowing them to to turn left out of the car park road whatever the state of the lights and use some of the space that is currently pavement to join the road. This would recognise the popular desire lines in the area, and allow cyclists who do the logical thing to keep themselves, and others safe, to be decriminalised. Another local project is the resurfacing of the Granchester Meadows car park – something which is long overdue, and another improvement which will be positive for cyclists. Personally I’m against new lighting of any kind on Parker’s Piece as I think there is a need to avoid plastering entire cities with light in every conceivable place, and its darkness can actually be quite a rare respite. I’m a big fan of the “solar studs” on the cycleway next to Newmarket Road between the airport and Quy. It can be pitch black in that area, and it would be difficult to stay on the path without them. I don’t find them overly bright and they certainly don’t seem to cast a beam upwards. However, I can’t see how they would help on Parker’s Piece. Although it can be a bit dim away from the lamps, it’s never so dark that you can’t see where the path is, and the solar studs only really show the position of the path rather than providing general illumination. Like Martin I’m not in favour of lighting up every corner of the City to make people feel safer, and I can understand why residents don’t want light pollution shining through their bedroom windows. Is this really the only way to stop nightime crime directly opposite the police station?! It is not just “elderly home owners” who oppose more lighting. People of all ages can appreciate the charm afforded by dim lighting arond cambridge. All one needs is the slightest sense of aesthetics and a freedom from H&S paranoia. It is not just “elderly home owners” who oppose more lighting. People of all ages can appreciate the charm afforded by dim lighting around Cambridge. All one needs is the slightest sense of aesthetics and a freedom from H&S paranoia. I frequently cycle at night through Jesus Green and find that dim lighting makes it quite beautiful and unique. It would be a shame for it to be flooded with light. I am not an elderly home owner either. In your opening paragraph you say that the Lib Dems “made an election commitment to improve lighting on Cambridge’s green spaces” in their 2012 campaign. This doesn’t seem to appear in their manifesto – the only lighting references I can find are promises to “install very low energy LED lighting in our car parks” and “invest at Mill Road in higher quality street lights than the County Council would provide”. Your report on the student hustings describes a more nuanced approach from Cllr Bick than from the Labour candidate. Do you have a link to what the Lib Dems actually did promise? Personally I have a lot of sympathy with the (other) elderly homeowners on this issue. At the West Central Area Ctte on the 1st of of March 2012 a planted question from student Liberal Democrats (who didn’t identify themselves as such) was taken during the open forum. It was this which prompted the policy announcement on lighting, got the lighting project on the Environmental Improvements list, and kicked off the press reports (example) which preceded the election. As noted it was also a key subject raised at the subsequent hustings. Can the lighting on Parkers Piece be improved? Students from both Universities find the dark paths daunting. Councillor Bick responded. This issue had been raised by the students unions of both Universities. He was happy for it to be added to the list of projects subject to caveats. Any lighting would have to respect the character of the open space of the area. In addition, the space was used by a variety of people for a range events and sports. Any additional lighting would have to accommodate those uses. An imaginative solution would be needed but he was keen that one should be found as this was a legitimate concern on the part of the student community and others. Mr Martinelli is currently listed as the Chair of Cambridge Student Liberal Democrats. I agree with the elderly (and not so elderly) home owners on here. Extra lighting is not necessarily an improvement. Still it’s to see planted questions getting a ready-prepared response. Well spotted! I do find it can be quite dark crossing this area, particularly navigating round those who wear dark clothes/no bike lights but then again if I want to choose a well lit path then it is easy to either use Regent Street, Parkside or Gonville Place which are more busy and well lit up. I recall lights were suggested in another location and the view was that it would create a false sense of security. I think that’s the case here too. And supposing for a moment I was in favour, which I’m not, then I doubt 4 lights would have that much effect. I made my suggestion asking for consideration of the ground level lighting which aims light at the ground rather than the sky at the West Central Area Committee on the 22nd of June 2012. Cllr Cantrill, the executive councillor for green spaces responded to say the option could be considered. He added though that Parker’s Piece was a sensitive area and there was opposition to improved lighting there. He appeared to be stepping back from the previous position and reverting to equivocating on the issue, he talked about improved lighting on Parker’s Piece as something which might happen, rather than something which will. The officer report to the committee identified a “risk” that the project might not get majority support from the public (presumably those members of the public aware of and commenting on the scheme as it is developed). My view is that the Liberal Democrats have won an election with this in their manifesto, they’ve used the issue to gain votes from the city’s students and others who want improved lighting, and it would be wrong to reverse their policy. I also asked about the progress towards lighting elsewhere, especially Jesus Green, Cllr Cantrill responded to say the tennis courts on Jesus Green will be re-opened soon by the Mayor to co-inside with Wimbledon. Cantrill said he saw Parker’s Piece as an initial test case / experiment the outcome of which would determine what if any action the council took on its other green spaces. The detail of the lighting proposals were not discussed. All the environmental improvement schemes appeared ludicrously over-priced so lights at what looks like over £1,000 each did not stand out as being silly money. The proposal for only lighting short stretches of the paths wasn’t discussed – this surprised me when I saw the proposals and I would liked to have heard more about it. When the cycling on the Lammas land car park access road item was raised Cllr Sarah Whitebread was the only speaker, she queried where the idea had come from and stated no one appeared to be supporting it. Cllr Cantrill raised a related point, he asked for Environmental Improvements Funding to be allocated for a permanent sign on the traffic lights urging drivers to pull up close enough to them to trigger the light change. He said this would be preferable to making the lights more sensitive as such a sign would be making permanent one guerrilla posted apparently by local residents so would show the council as being responsive. @guystepney @RTaylorUK Hi Guy – plans are still being worked up. Update on our ward website soon – I’ll give you the link when it’s online. It isn’t clear if the plans she refers to are for Parker’s Piece alone, or as the the questioner was asking about the city’s green spaces more broadly. At the 28 February 2013 West Central Area Committee I asked why floor mounted lights like those pictured above at the top of this page were not being trialled. Chair, Cllr Reiner, said they had been ruled out on the basis of their manufacturers written specifications. I noted that the other lights involved in the trial were not being assessed on the basis of their written specifications but via the in-situ trial; and asked who had decided not to include them. Cllr Reiner said that Cllr Bick, who was absent, would be the person to answer that question. Cllr Whitebread suggested floor mounted lights would be a hazard to cyclists and would have been excluded on those grounds (however the trial includes a retractable light which when retracted is a much bigger bump, and not something I’d say was cycle-able over, so that argument doesn’t appear to make sense). I was told that a response from Cllr Bick will be requested by the committee, however it appears that any answer will come after the trial and associated consultation has been completed. Member of the public Mr Lawton spoke at the meeting to note the installation of lights on poles is contrary to the management plan agreed for the space. He accused the councilors of acting to seek the student vote by moving to install the lights. I also note the area committee system is not being used by councilors; it is only via public questions that the trial has been raised at the committee. At the committee held just days before the trial of various lights was installed there was no mention of it at all. Thanks Richard for continuing to watch this subject. I have been very suspicious about the weight of political support for the trial scheme such as the front page councillor photo opportunity in the Town Crier. Reading your previous posts again I can see why I feel that way. I was slapped down tonight, but I maintain that the essential character and integrity of the common must not be sacrificed for an intrusive scheme that may only reduce the fear of crime anyway. As too often happens the report is clearly gathering dust somewhere. It recommends management plans should be drawn up every 5 years. I have never come across any. I think it is time that a Friends of Parker’s Piece be formed to make sure the council enacts it’s excellent conservation plan.. Wearing my chairman’s hat of Cambridge Save Our green Spaces, http:///www.soscambridge.org.uk I’ve been asked to debate this issue on BBC Cambridgeshire breakfast show early this Monday morning around 7:15am. The hat isn’t edible unlike Cllr Cantrill’s. At the City Council’s Environment Scrutiny Committee on the 8th of October 2013 the committee and Executive Cllr Andrea Reiner agreed to go ahead with plans to install street lights on Parker’s Piece. The meeting was told the plan is to get them lit by January 2014 so they will provide some benefit this winter season. There is a little more work to be done modelling the spillage of light onto the space from street lights on Regent Street; being mindful that they are to be upgraded as part of the county wide PFI scheme. There will be a little more consultation on the details. There was a public speaker on the item, a Lauren Steel, who started by saying she was speaking “on behalf of all students in Cambridge”. I think this highlights a problem with those who make contributions to council meetings; they are free to make grandiose claims about who they represent but are not required to back them up by explaining the source of their mandate . Cambridge News reporter Chris Havergal identified the speaker as being @CUSUWomen. If she was speaking on behalf of students of other universities, schools and colleges in the city is something I still don’t know. Lauren Steel repeatedly said “gender based violence” during her contribution; she claimed “gender based violence” was occurring on Parker’s Piece and “gender based violence” would be reduced by lighting. She also said things like “Lights are women’s rights”. I thought the focus on women was odd; lighting the space is surely something which has an impact on everyone. One thing that was raised by Cllr Blencowe was the possibility of installing a power supply for events at the same time; officers advised such a power supply would incur a standing charge and a business case for installing one would need to be devised. The on-going revenue costs for the project will be incorporated within existing revenue budgets. Extra information provided to the committee shows six new 8m high columns are proposed. £10K sounds like a lot of money for a lamppost. Where do they get them from?